During our trip to Disney World we visited the Lego store at Downtown Disney. I'm not sure all that they had in stock but it seemed like they sold every active Lego set available. One set I picked up because it was rather unique and because I hadn't seen it any place else was a Lego Sea Monster. 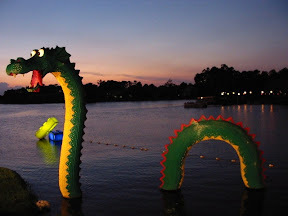 The sea monster set was a replica of a giant Lego monster outside the store sitting in a lagoon. When Mom and I went to Disney World on our honeymoon we took the below picture. Now that we are back with the kids I thought it would be neat to have a Lego statue of it. I waited until we got home to assemble the set; I didn't want to lose any pieces. Upon seeing the box Alyce was excited to help me assemble it. I was hesitant at first to let her help. I wanted it for myself and because I wasn't in the mood to find every piece for her and to tell her where they go. This all took place the day we got back from Disney World and I didn't have the energy to fight against her demands. So just before she broke into tears (she was exhausted too) I relented and let her help put it together. Alyce did a really great job putting the set together. There were lots of little pieces but they were standard Legos and not weird ones so it was easy to find what we were looking for. In addition two of pieces of body were identical so after finishing the first one Alyce cruised through the second. Most surprising to me was how well Alyce handled the instructions. Once I showed her the pieces that were needed she would compare the current picture vs the previous and was able to put the pieces in the right position. What I thought was going to an exhausting frustrating time turned out to be a pretty neat father daughter moment. 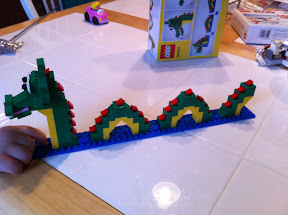 Alyce isn't ready to graduate to big kid Legos yet but there's a preview of things to come. 0 comments on "Lego Time"